Situated in the blue ribbon area of Sydney’s North Shore, our client had a very specific brief being a knowledgeable IT security consultant. This build utilities Savant control systems to allow the automation of multiple electrical subsystems. There was an extensive consultation process to determine the most robust way to incorporate everything into Savant. 5 Videos Zones & 3 Audio Zones. All zones were to have stereo sound with Music Streaming aside from the Media Room and Living Room which were to have a basic surround sound packages. C-Bus Automated Lighting System. Lighting Control required custom lighting scenes as well as dimmed and switches control in various rooms. The C-Bus system was to be controlled via C-Bus touch panels as well as Savant Application. A CCTV System needed to be setup to view the perimeter of the house and to be monitored via the Savant Application. 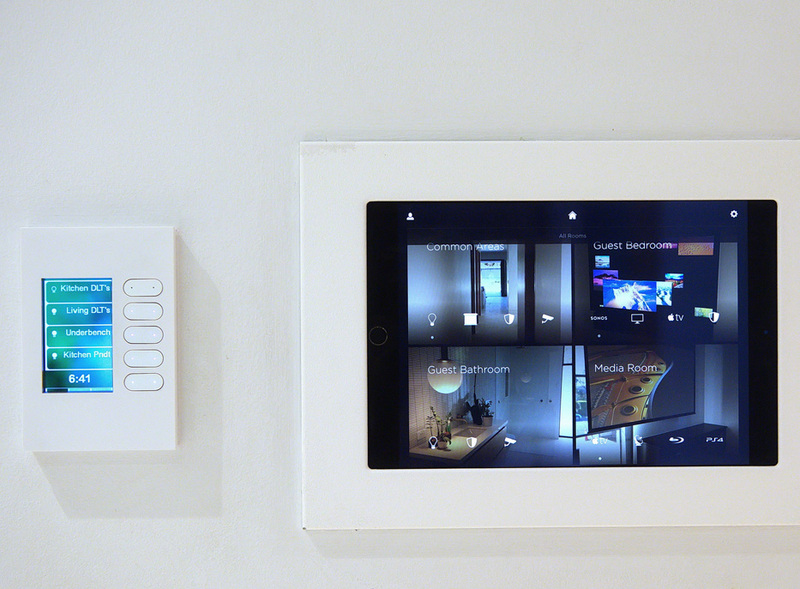 A remotely managed Security System that could be integrated into Savant was also requested. All of this technology needed to fit into a previously set, relatively modest budget. The lighting control system is a C-Bus system with Saturn Zen keypads. It controls all indoor & outdoor lighting loads, Velux skylights with integrated blinds, Indoor Somfy blinds, Outdoor Cedar Blinds. The C-Bus also integrates with the Pool by switching the lighting and pump systems. Lastly, a Irrigation schedule has been included in the C-Bus programming to automate this feature. The NESS M1 security system is a fully monitored back to base network. It consists of Internal PIR Sensors, garage door control, piezo screamers, reed switches on external lower doors and a Biometric reader located in the entry with monitored electronic door strikes. It is integrated into the C-Bus system as an input and has a lighting trigger upon breach of entry. During the construction of this project, Savant did not have a reliable Intercom solution that was able to be integrated into its Interface seamlessly. 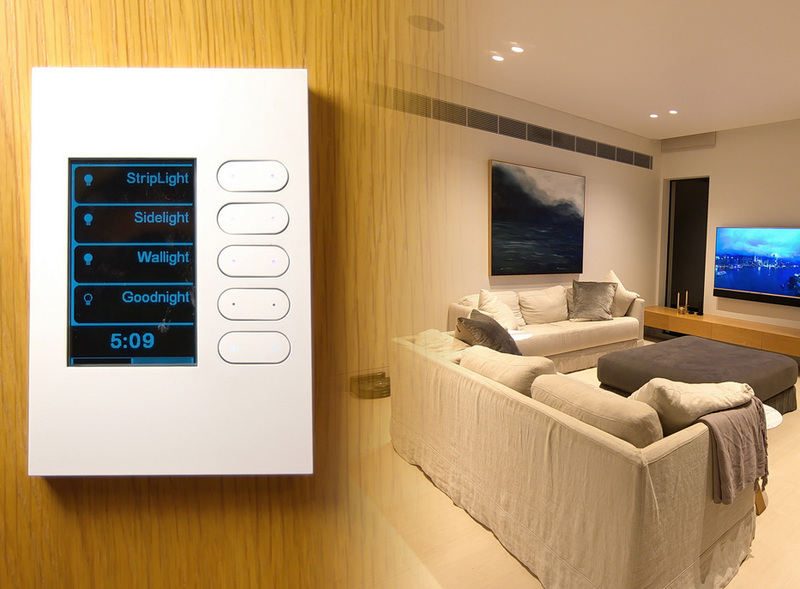 The Intercom is the only system in the home which is not controlled via the Savant system. This is custom designed AiPhone JO Series with a Biometric Reader. There are 4 x AXIS dome cameras located on every corner of the property which can be monitored via the Savant Application. The client provided a fully managed Cisco Meraki network as well as Cisco WiFi throughout the entire property. The HVAC system is a Daikin air conditioner which is controlled via the Savant Application. This is done using CoolmasterNET Module which allows Savant to control temperature & environment scheduling. The irrigation system is controlled via the C-Bus network and utilises the C-Bus Irrigation Controller for Irrigation Scheduling. Irrigation scheduling allows the client to efficiently utilise their water consumption. The lighting control system is a C-Bus system with Saturn Zen keypads. It controls all indoor & outdoor lighting loads, Velux skylights with integrated blinds, indoor Somfy blinds and outdoor cedar blinds. The C-Bus also integrates with the pool by switching the lighting and pump systems. Lastly, an irrigation schedule has been included in the C-Bus programming to automate this feature. Access control technology has advanced rapidly during the last few years, with a number of options now available. Finger-print access is one of the most secure access systems available. Traditional access systems such as keys, cards, pin numbers etc. can be lost, copied, shared or stolen. Finger print access is unique to the individual and therefore cannot be reproduced or shared. It is also possible to provide limited access. For example if you know the gardeners are on-site certain days you can allow access during specific times on those days to specific areas of your home. Outside of those hours access for that individual will be denied. 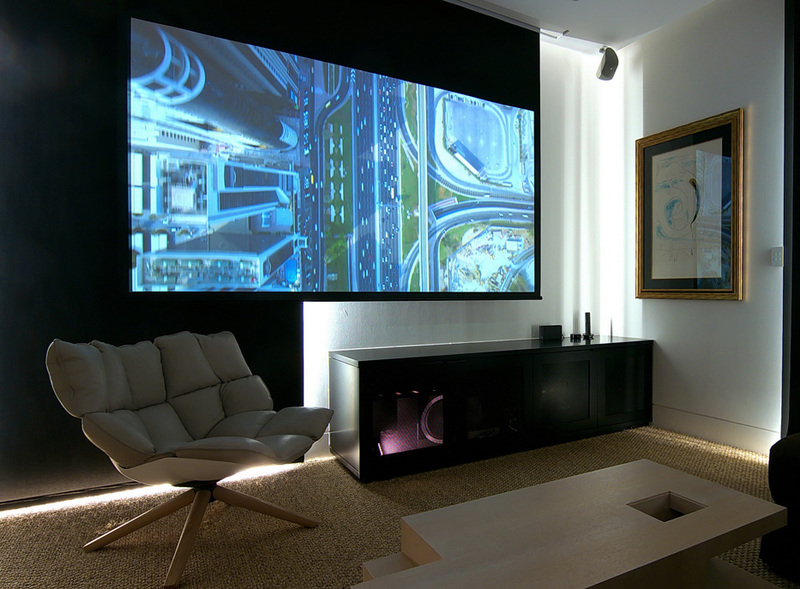 The media room utilises a Sony 4K projector, projecting onto a Screen Technics 100” motorised 16:9 Screen. The LCR speakers that we used were B&W HTM62 with B&W M1 satellite speakers for ATMOS and B&W CCM683 in-ceiling speakers as rears. The system is driven by a Yamaha RX-A1060 surround sound AV Receiver. There are local video sources in this area which are not distributed; namely Amazon FireTV, Nintendo Wii and Playstation 4.